My biggest challenge this summer is to keep my kids busy having fun....and OFF tech. Not completely, mind you, because there are a lot of super online programs happening, but I definitely want to limit the amount of time they spend this summer staring at a screen. Because we're traveling a lot and have family coming to visit, I'm not spending a lot of money on summer camps. So that leaves me with the problem of trying to kick boredom to the curb and keeping my kids happy. I suspect that I'm not the only one with this issue. Therefore, I'm going to be sharing various activities and opportunities over the next few months to keep your kids entertained. First, I want to be very clear that many of the activities will be based on supplies and kits I find at my local craft stores. I have not in any way been compensated (or even approached!) by these stores. I simply went to them in my search of supplies and found great bargains, activities, books, or opportunities and spent my own money/time. I'm going to spend the summer sharing them with you by posting at least three times a week. Okay, on to summer fun! If you want to be super logical about it, you can begin by deciding on a budget. For example, I might say that with my two kids I'm going to spend $100 a month total on activities and/or classes. That's $50 per kid. Sounds reasonable to me. 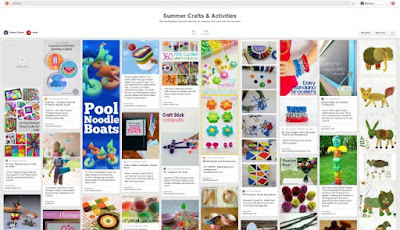 Next, I started scouring the web, my huge library of craft books, as well as magazines for ideas on super fun crafts. I've already started a Pinterest board that I'll be adding to daily. Feel free to follow it! If you are participating in the L4LL Latino Children's Summer Reading CAMP, then don't forget that there is a Summer Bucket List your kids can download in English or Spanish under the Summer/Verano theme. It's got a lot of ideas and you can stick it right on your fridge for easy reference. After starting a list of fun crafts/activities that they want to try, I had the kids put together a list of supplies that we needed to buy. We already had most of the items in our School Supply & Art cabinets, but there were a few we'd run out of or had never thought to use before. Then we headed off to our local craft stores to stock up. It just so happened that we were at Michaels on the first day of their summer Passport to Imagination classes. Do you know about them? Every Monday, Wednesday, and Friday from 10 - 12 pm, your kids can make crafts with a Michaels educator. The classes run for 7 weeks and each week features a different theme. This week was all about PIRATES! My kids made a pirate doubloon necklace and an eye patch. 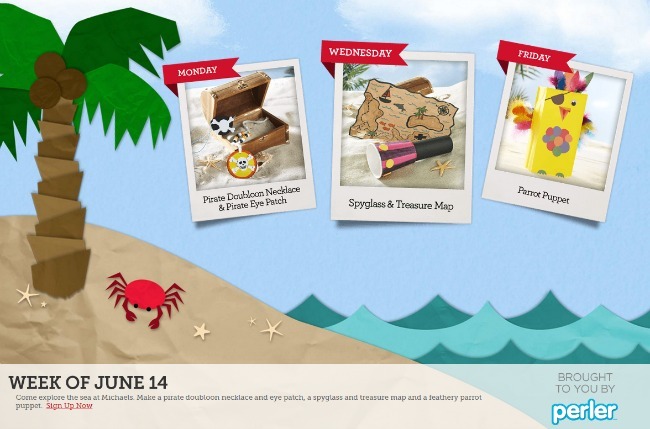 You can click here to see the themes for all of the remaining weeks. The classes are fairly inexpensive; $5 for one class or $12 for three. My kids had fun and wanted to go back on Wednesday, but we had other plans already. We're looking forward to going back soon, though. The good thing is that you can just pop in to whichever class is convenient for you! While the kids crafted, I took their list and browsed the store, and went to a few others to collect all the supplies we needed and to browse for more ideas. 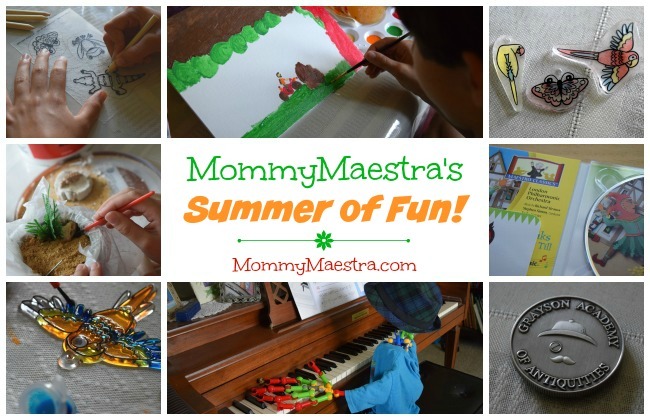 We returned home with a bag full of goodies and a ton of excitement for a full summer of creativity!